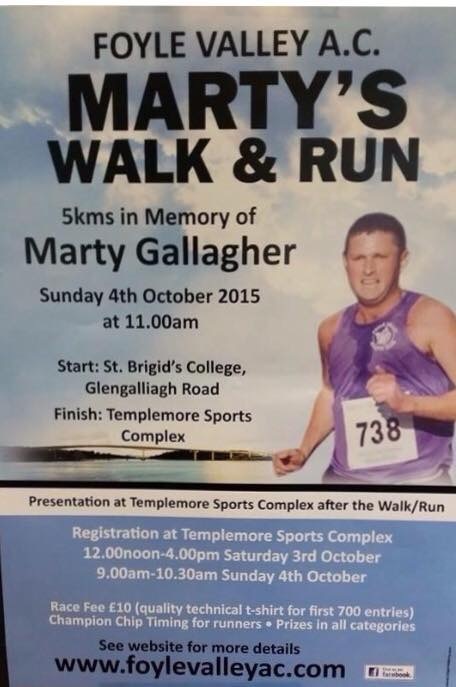 On Sunday October 4th the Marty’s Run 5 Km run and walk will take place. This is the sixth year of the event which is in memory of Marty Gallagher, a much respected and gifted member of Foyle Valley Athletics Club who lost his life tragically in 2009. The huge number who consistently turn out for this event is testament to the many friends that Marty had, not only running circles, but in the Manchester United Football Supporters Club and in his general acquaintances around Derry. Marty made a big impression on anyone who got to know him. Starting opposite St Brigids College, Glengalliagh Road, at 11am on Sunday 4th October the route will go along the Glengalliagh Road, turn left down the Skeoge Road and left again at the Buncrana Road to finish at Templemore Sports Complex. The race itself will start at 11am. As large numbers are expected the organisers would like as many people as possible to register on the Saturday to avoid any delays on Sunday morning. Competitors should allow approx 15 minutes to walk/jog from Templemore Sports Complex to the start at St Brigids College. Martin Gallagher senior will act as starter for both the run and the walk. The walkers getting away just after the runners. Please register early to avoid delays!